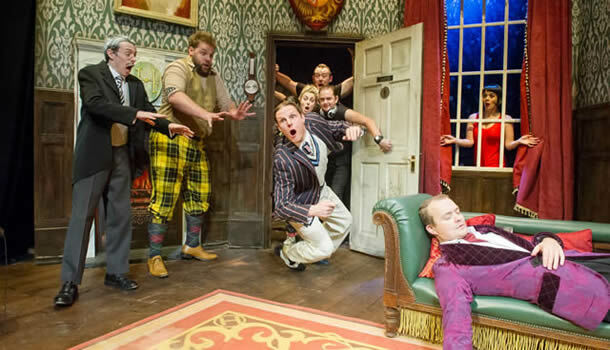 First performed above a pub, Mischief Theatre’s The Play That Goes Wrong has come a long way and is enjoying a run at the Duchess Theatre, which has been extended to September 2016. It seems that the West End has a hankering for an overtly slapstick comedy that is quite unlike anything else currently playing in London. Brought to us by the fictional Cornley Polytechnic Drama Society, this is a play-within-a-play, where actors are playing actors starring in a play called ‘The Murder at Havisham Manor’. If you were to compare The Play That Goes Wrong to anything, it would be to Fawlty Towers, the notorious comedy in which everything really does go wrong. In this particular play, the premise in the title is wholly fulfilled as the audience experience everything from disastrous stage managers to a set that completely falls down when you least expect it. Nigel Hook’s set design is arguably the most impressive part of the production and is magnificent from start to end. Balconies, windows, banisters and a grandfather clock are used to such imaginative potential that it would be a shame to detail exactly how the set is manipulated, as it is such a large factor of the show’s success. Director Mark Bell has achieved something wonderful with this show. As the play descends into absolute chaos, the fighting, misunderstandings and accidents are perfectly timed and choreographed ensuring there is always something to look at onstage. The audience are constantly shocked, but we never feel unsafe as the chaos is so well controlled. There is laughter throughout the show and whilst some jokes become repetitive, The Play That Goes Wrong quickly redeems itself by surprising us with a new gag or mistake. Not all the jokes are entirely original, but they are all typical of the a traditional farce that will entertain and delight any audience. The meta-theatrical style that this production adopts works very well as a structure, so when the actors deliberately slip out of character in anger or frustration, it is highly entertaining. A slightly bothersome trait is that the acting is deliberately bad and at times this becomes tedious as it consists of a lot of shouting. Having said that, the actors are clearly very talented and work well together. The Play That Goes Wrong is very much an ensemble piece and each cast member clearly enjoys being part of the production. Harry Kershaw as Chris was exceptionally funny, playing the Cornley Polytechnic director starring in his own show. Throughout the play he tried very hard to keep his cool as he watched his own play crumble around him. Leonard Cook as Robert was also fantastic, visibly losing his rag when things did not go right. For this particular performance Adam Brydon understudied as Max and was outrageously entertaining, giving small waves and smiles at the audience like a primary school child excited to see his mother. The physical comedy is excellent within this play, but these jokes can only go so far. At points it is clear that this was once a one-act fringe show that has been stretched to fill a two-hour slot and it could have done with being at least half an hour shorter. Despite that, The Play That Goes Wrong is a production that can be appreciated by the broadest of audiences. It is rare to get a comedy in the West End that is so accessible and brings back the true elements of farce and slapstick that we all enjoy so much.